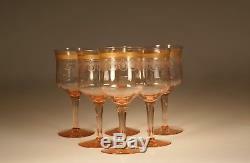 Description : Set of 6 Vintage Depression Era Fry Glass Pink Wine Glasses or Water Goblets. Wonderful design with a wonderful looping deco needle point etching. Above the etching is a gold band with zigzag patterning. The rim is also trimmed in gold. The gold is all in wonderful condition. Made by a quality glass company. Condition: Fine condition with no chips, cracks or troubles. Dimensions : height 6-3/4 inches; diameter is 3-1/8 inches. A fine addition to your collections. 20 years in the Antique Glass Business. 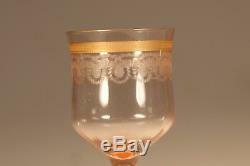 The item "Set 6 Vintage Fry Glass Deco Pink Wine Glasses Water Goblets Gold Trims c. 1930" is in sale since Wednesday, November 15, 2017. This item is in the category "Pottery & Glass\Glass\Glassware\Elegant\Unknown Maker". The seller is "tomglass" and is located in Niagara Falls, New York. This item can be shipped to United States.